OSHA and FRA require blue signs on any track where locomotives of the railroad serving your plant will operate. 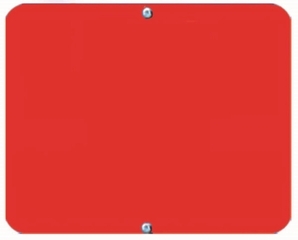 Red signs may be called for in special situations. Red signs satisfy OSHA Blue Flag Rule. • Sign plates are 12" x 15", and made of .080" Aluminum Plate. Reflectorized.